Don’t Miss: Sight of the underwater ruins of the sunken city of Simena! Visit the ancient sites at Demre, Myra and Kekova on this unmissable full-day tour which includes an English-speaking guide, hotel transfers and a delicious lunch! 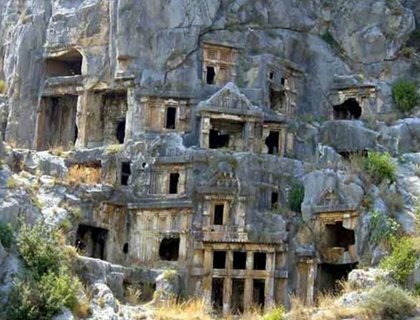 Visit Demre to see the Lycian tombs at Myra and the Church of St. Nicholas. Sail to Kekova Island with its sunken city. Discover the sunken city of Simena and visit the Lycian necropolis at Teimiussa. Tour includes an English-speaking guide, lunch and round-trip transfers from Side, Manavgat, Gundogdu, Colakli, Evrenseki, Kumkoy and Titreyengo hotels. You’ll head to Demre first to see the fine examples of Lycian tombs at Myra and the Church of St. Nicholas, the saint otherwise known as Santa Claus! After lunch, sail across turquoise waters to picturesque Kekova Island with its sunken city. Discover the extraordinary underwater ruins of the sunken city of Simena and visit the Lycian necropolis at Teimiussa. There will be plenty of opportunities to swim and snorkel if desired, so don't forget your bathing suit and towel! Please note that for your comfort, in the very hot months such as July and August, the visiting times for open air museums and ancient ruins may be shorter than planned.